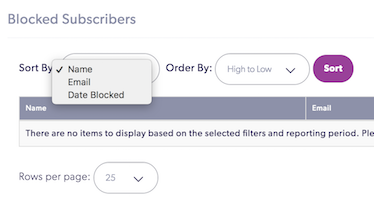 The Blocked Subscribers Component allows you to obtain a list of subscribers you’ve blocked from receiving your organizational content. You can sort by Date Blocked, Email, and Name. Remember: You can also filter these subscribers by clicking the orange filter button.